205 Live looked to continue it's hot streak this week with another 50 minutes of Cruiserweight action. The Cruiserweight Championship tournament reached the semi-finals as Roderick Strong took on Cedric Alexander with a title match and spot on WrestleMania on the line, Akira Tozawa & Hideo Itami tagged up again to take on Lince Dorado & Gran Metalik and Gentleman Jack Gallagher returned to take on the debuting Murphy Myers. But was it any good? Here's our review. Cedric Alexander earned himself a Cruiserweight Championship match at WrestleMania with a victory over Roderick Strong in a gorgeous tournament semi-final match. One of the most physical Cruiserweight clash in recent memory, this match was full of big powerful strikes, slick reversal sequences, near falls and big highspots, as the two left everything in the ring as their sublime selling made the match feel like the most important thing in the world. The mirroring of near falls with both men getting a foot on the ropes after the Lumbar Check and the Neuralyzer respectively was a cute touch, but the two moments that stand out in particular was a spot that saw Strong standing on the apron and using a torture rack backbreaker to send Cedric crashing back first across the top turnbuckle and a great moment where the pair began scrapping after the End of Heartache nearfall, as the crowd went nuts and the commentary team sold it for all that it was worth. The final moments capped things off well as the two reversed a number of signature attempts, including Strong being able to block Alexander from reversing the Strong Hold and get a near fall, before Alexander wrapped Strong up in a small package to advance. It made complete sense, considering the match had been based around neither being able to put the other away with their finish and it says something about the quality of the action that despite getting fifteen minutes of pure action, I ended up wanting to see these two go at it for ten, fifteen, twenty more minutes by the time the pinfall was counted. The best match of the tournament so far, the ball is in your court now Drew Gulak and Mustafa Ali. After the match - An emotional Cedric Alexander put over his opportunity at WrestleMania and talked about his daughter in a beautifully touching interview. A good Cruiser tag opened the show as Akira Tozawa & Hideo Itami picked up their second win in as many weeks, as Itami picked up the pin on Gran Metalik with a weird spinning facebreaker/stunner situation. The awkward nature of Itami's new finish was the only drawback on what was a fun back and forth tag bout, that began to establish the more vicious side of Itami that we saw towards the end of run on NXT. Arguably whilst Itami felt like the storyline focus of the bout, he was the least impressive of the four men, as Dorado and Tozawa opened with a lovely mirrored sequence, with the pair also having a strong chain as Dorada searched for a tag, whilst Metalik had a killer hot tag that was packed full of variety as he everything from tilt-a-whirl backbreakers to overhand chops, from reverse slingblades to a front missile dropkick. The highlight of the bout was a super cool looking dive from Dorado onto Tozawa, using Metalik's back as a springboard. I'd like to see more apparent teamwork from Itami & Tozawa as they seem to a permanent tag team going forward and really could do with some tag offence to make them feel like more than just two single lads that have been thrown together because of their nationality. After the match - Hideo Itami and Lince Dorado had to be separated by their teams, after Itami had trod on Gran Metalik. A swift victory for Gentleman Jack Gallagher as the Englishmen picked up his first win since October against Murphy Myers (IWAU's Joey O'Riley), with a headbutt. 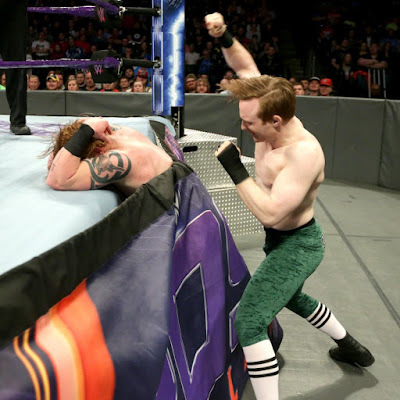 Gallagher dominated the entire match, with Myer's offence only coming when Gallagher began to focus on 205 Live General Manager Drake Maverick who was sat doing guest commentary for the match. Gallagher is someone who has been frustratingly booked on 205 Live for some time, especially since he managed to get so over at the end of 2016 and beginning of 2017, and is someone who we know has tremendous talent in a variety of styles from his previous work in FutureShock, GPW and PROGRESS, so here's hoping that this new version of the purple brand will provide the Mancunian with plenty more opportunity to showcase his skills at a high level going forward. - Another superbly dramatic and beautifully shot promo from Mustafa Ali as he discussed his semi-final next week, calling Drew Gulak a bully for his actions towards Mark Andrews last week.